Apart from the high-end mobile devices launched this year, Samsung is also reported to be preparing to release a new range of handsets under the "Galaxy O" name. Two models are expected to come out from this line, the Galaxy O5 and Galaxy 7, both them said to focus on Samsung's virtual reality (VR) functionality. The Galaxy O series was first reported by Samsung-focused website called SamMobile.com. A week ago, the site claimed that the South Korean device maker will launch two new devices with model numbers SM-G550 and SM-G600. The former will likely be the Galaxy O5 while the latter will reportedly arrive as the larger Galaxy O7. On Tuesday, fresh reports hit the Web indicating that a certain Samsung device has just been certified by the Bluetooth Special Interest Group (SIG), the organization responsible for issuing Bluetooth licenses to manufacturers. An apparent Samsung device with design name and model number "SM-G6000" has passed through the Bluetooth SIG site, adding fuel to reports of an impending Galaxy O release. To be specific, the certification issued on August 25 is for a model only described as "Samsung Mobile Phone." However, the model number is almost an exact match to the alleged Galaxy O7's SM-G600. 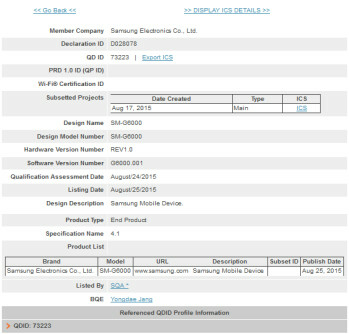 The device represented by the listing has an extra zero on its model number, possibly signifying that it will be a carrier version or a region-specific variant of the Galaxy O7. No other hardware or software specifications are revealed by the Bluetooth SIG certification. As of the moment, only its name and the fact that it will have Bluetooth support are the only credible things known about the upcoming Galaxy model. It is worth mentioning that the device maker's Galaxy O lineup are rumored to be developed in partnership with Oculus VR, the same American company Samsung has tapped to co-create its virtual reality headset called Gear VR. Samsung has confirmed that it would soon release an updated Gear VR for its new Galaxy Note 5 and S6 Edge+ flagships. In Galaxy O5 and O7's case, they will most likely be unveiled during Oculus VR's Connect2 Developer Conference that will take place in Hollywood, CA from September 23 to 25. The event will reportedly be where Oculus will launch its own multi-purpose wireless VR headset. While it can be safely assumed that the Galaxy O5 and Galaxy O7 will support the Samsung Gear VR, it is not clear whether these O series handsets will also work with Oculus VR's upcoming gadget.